6x4m marquee or 4x6m marquee? In the marquee industry there is not a huge amount of terminology for someone new to the scene to get used to. One is getting used to feet and metres and how to switch between the two (3m=10ft essentially), most customers prefer everything in metres but you still get some that need it in feet. Another standard to get used to is that when talking marquees the width comes first and the length second. A 4x6m marquee is very different to a 6x4m one for example. A 4x6m Marquee means that the A-frames are 4m wide and it is 6m long (three 2m bays). A 6x4m marquee on the other hand has 6m wide A-frames and is 4m long (two 2m bays). The most popular way of covering a 4x6m area is with a 4x6m marquee, there are however times when this is not the best option. If you already own a 6m wide marquee or have spare 6m metalwork then you can just buy a 6x4m roof and therefore increase your hiring potential without buying a complete new 4x6m marquee. If the marquee is going up against a house then it is far easier having the gable butted up for weathering and access purposes. If the customer needs the 6m side of the marquee up against the house then it is best practice to go with a 6x4m marquee rather than a 4x6m one. Thanks for reading, apologies for the gap in writing but this summer has been even busier than usual. Normal service (articles & blog posts alternating every week) should now be resumed. Posted in buying marquees, marquee hire advice | Comments Off on 6x4m marquee or 4x6m marquee? It depends on the frequency a marquee is used, the environment it is erected in, the material in question and the weather conditions but in general marquee hire companies will lightly clean a marquee nearly every time it goes up but do a thorough ingrained clean maybe twice a year. By lightly clean I mean wipe down any marks or mud that may have splattered on to the sides, this can be done when the marquee is erected on site. By ingrained clean I mean using a power washer, a floor scrubber or brush and strong marquee cleaner product. Or getting a professional marquee cleaning company in. Ingrained cleaning removes the grey film that builds up on marquees over time. dirt and residue from trees. If it rains when your marquee is under a tree a lot of dirt gets washed off leaves on to your marquee, there may even be some sap on there too. The dirtiest marquee I ever saw was one erected under a tree. These need ingrain cleaning immediately as they won’t be good enough to hire out and leaving sap on PVC would not be good. PVC can be cleaned as above, good quality PVC (like ours) will have a laminate coating to make it easier to clean. Clear PVC (window panels) must be cleaned very carefully so the clear material isn’t scratched. Poly/PVC you have to be careful as the PVC coating is a single layer than can be scratched off with aggressive cleaning. PE material can be cleaned similar to PVC though doesn’t have a laminate coating so will not come back as new. The most important point of all – never put your marquee away when wet. A wet stored marquee will create mildew (PVC & PE) or may rot (canvas & the stitching in any stitched marquee). We shall be holding some training courses in the next couple of weeks. We are planning to run courses in PAT Testing, Event Electrics, and Event Lighting. These are tailor made to the marquee/events industry. We have a new member of staff to carry out the training courses, so these can now be held at our premises near Plymouth or closer to you. If you are interested in getting more information then please email louise@essentialsupplies.co.uk to register your interest. Training can be essential for growing businesses especially to learn about industry best practices. How big a dance floor do I need in my marquee? A very common question. The way to work it out is to multiply the number of guests by 2.5 and that’s the square footage dance floor area you would typically need. This assumes only around a half of guests would be dancing, if you know you have a more active than average group then go bigger. This does not include space for a Band or DJ -NEVER put them on the same surface (ie on the dance floor) as their equipment can jump around. Larger dance floors (or even a fully boarded marquee) may be needed for more active group style dances like a ceileih, callee, kaleigh, barn dance. Don’t get too hung up about the size of the dance floor, if it gets very busy then the dance floor is often just a starting point as people then dance just off it anyway. As always if in doubt just contact us and we’ll be more than happy to advise. A new design of our website is being launched over the next 2 weeks so don’t be alarmed if you notice some changes -please let us know if you find any mistakes though! Posted in Dance Floors, marquee hire advice | Comments Off on How big a dance floor do I need in my marquee? How big a marquee do I need? 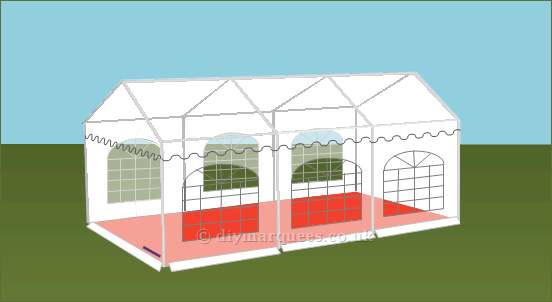 Asking how big a marquee is required is one of your main jobs as a marquee supplier. Often the size of the garden will dictate the size of marquee but you still need to know how much space everything takes up to then plan suitable numbers. Round table seating up to 10 (usually 5ft or 5ft6in tables): Allow 3x3m -this includes space for walking between tables so for example a 6x12m area can fit eight 3x3m boxes so can fit eight round tables with space to walk between. Saying that it is more comfortable leaving one out to stagger the tables like this example. When planning layouts you also want to consider where people walk in to the marquee -ideally you don’t want guests walking straight in to a table so you may have to leave a gap. For marquees that are a bit tight consider having the entrance near the bar or dance floor to give some space. Often you are asked to put marquees up over features like bushes, flower beds, small trees, water features or even swimming pools. This really adds character to a marquee so in my eyes should be encourages though as the marquee supplier it does make life a little harder and you should point out that it is not useable area. Often customers will need a larger marquee to allow for incorporating these features. When planning the marquee remember which direction guests will be arriving from – you want it to look impressive. Windows make the marquee look more inviting – you don’t want guests believe that they are walking in to the back of the marquee. Also keep in mind access to the toilets, this may require an additional exit in the marquee. 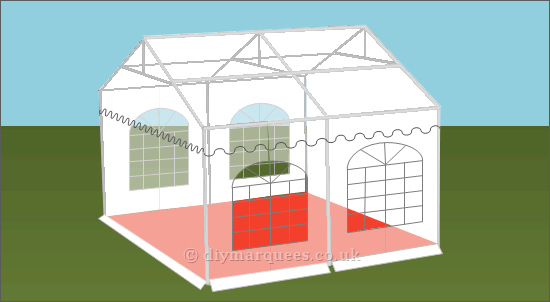 Experiment with layouts using our interactive marquee planner, it allows you to drag furniture in to a marquee to experiment with capacities and layouts. Posted in marquee hire advice, site visit, starting out, wedding marquees | Comments Off on How big a marquee do I need? Starting up any new business is a big step and can be quite daunting, marquee hire is no different. something we encourage is to do a lot of local research beforehand. Use all of the usual search methods (google, bing, yellow pages, local magazines) and see how much competition is out there. If your local area is already saturated with marquee companies then it may be difficult to start up in competition. See what marquees other companies are offering and how large an operation they are. The company that bought my old marquee hire business stated they didn’t want to do any job less than £2,000 (! ), there is a very very good living to be made solely doing marquees under £2,000 I can assure you. Several of our existing customers work very successfully with a larger marquee hire company nearby, they pass on any larger jobs to the nearby company and in turn any job that’s too small for the large company passes it on to our customer. At this point it’s also worth looking at where everyone advertises and if you can see any gaps. We found local parish magazines to be a useful supply of business, the advertising cost is so small that it pays for itself very quickly. This blog is intended to offer help and advice to those in the marquee hire industry or who are thinking or joining. From experience I can say that it is a very enjoyable professional that keeps you fit and has a large amount of job satisfaction. Obviously the first question to ask is what marquees should you buy and where should you buy them from. Experience. We’ve run a successful marquee hire business (and would still be doing so bar a freak injury), we know what products are needed and the quality of service required by a supplier. We are also on hand to offer advice whenever required. Stock. We keep very large stocks enabling you to offer size options you may not actually have. Accessories. You may not need too many accessories when you start out but over time as you expand you will require more and more accessories for your marquees. Spares and replacement parts. Although our marquees are as durable as we can design them accidents can happen and parts can get damaged. Unfortunately as a hire company you often only find out when the marquee comes down (Mon/Tues) and you may need it to go back up in a few days. We keep large stocks and can get spares to you quickly (usually overnight). Before buying from elsewhere just phone them and pretend you need a spare part and see the service on offer, it may be fine, it may be that you have to wait a long time for a part to come from abroad (or they may refuse to sell you spares).  We have a lot of people phoning to find out if our spares are compatible with other makes that they cannot get spares for. A trusted family business. We have been in business over 30 years and are a second generation family business (the 3rd generation is in training). We have built up a reputation for being reliable, value for money backed up with excellent service. Regarding what marquees to buy my recommendation is always not to buy too many to start with. You need one or two with which to learn how to put them up but then you can essentially offer all of the sizes we supply and just buy a marquee when you have a booking for it. If you already have a larger marquee of the same width you can always just buy a smaller roof. The reason we have been in business for so long is because it is in our interest for you to be successful, to offer products that give you great returns on investment and ensure we supply everything you need to expand the business in the future. Contact us today to see how we can help you start up or expand your marquee hire business. Should I remove the sides of my marquee in strong winds? No, a marquee is far more wind resistant with the sides on rather than off. For some reason there are many people who believe that leaving the sides off a marquee ‘lets the wind pass through’. I will try to explain below why this is not true and why leaving the sides off of a marquee actually makes it far more susceptible to the wind than leaving the sides on. The diagram above shows how the wind passes over a marquee and how any wind going in to the marquee gathers and lifts the roof up. The best way to avoid this is simply to have the sides on the marquee facing the wind and have the marquee well anchored down. Please note that this article is dealing with marquees in strong winds but not extreme weather. Marquees should not be left erected in extreme weather conditions. The people who advocate taking the sides off in strong winds believe that the above scenario is best solved by removing the remaining side panels, thus allowing the wind to pass harmlessly through the other side of the marquee. It doesn’t. There are two factors in play if the sides are off. i. Wind building up under the marquee roof – this still happens even if that other side is taken off. Don’t believe me? Try walking across a field in windy conditions with an umbrella – by taking the sides off your marquee you’re turning it in to one very large umbrella. The reason a wing attains lift is by the air passing over the top at a greater speed than underneath and so the differing pressures caused creates lift. A marquee roof isn’t as aerodynamic as a wing but a lifting force will still be created, not only that but the steeper the roof the more force there will be – another reason for having a 20degree roof/3m apex on 6m marquees as discussed last week. Ensure the marquees are well anchored down, that means tie down kits as a minimum. Know your marquees limitations -if Michael Fish states there definitely won’t be a hurricane then resign yourself that the marquee has to come down (this is rare, it happened once in the 10+ years I ran a hire business). Thanks for reading, as always feedback is gratefully received. Posted in marquee hire advice | Comments Off on Should I remove the sides of my marquee in strong winds? Most commercially used marquees in Britain use a 20degree angled roof (3m high apex for 6m marquees with 2m leg height) as that gives the greatest wind-resistance by design, obviously it still needs well anchoring down. When designing a marquee we consider the likely weather the marquee has to withstand in Britain: rain, snow and wind. Rain is reasonably straight forward, any waterproof cover with enough angle on the roof for run off would do the job. Snow and wind are perhaps surprisingly treated together, this is because it is very difficult to design for both in the same marquee. Consider alpine chalets that have very steep roofs to prevent snow settling – if you used this design in a marquee it would make it far too susceptible to wind as described below. So in general marquees in Britain are designed to be strongest against wind and are not rated for snow-loading (hire companies get round this by leaving heaters on to prevent snow settling). The taller a marquee is the greater the wind force it has to resist. The strength of this force is increased by the square of the height increase so if the height of a marquee is doubled the force it has to resist actually goes up by 4 times as much. The lower the apex height the more wind resistant a structure will be. As the roof angle increases the apex gets higher and the surface area of the roof increases. By the law used in hydraulics the pressure per square metre is constant, if the area increases then there is more upward thrust when the wind gets inside the marquee. To reduce the likelihood of damage again the apex should be as low as possible. It’s no coincidence the industry standard for a pitched roof is 20degrees (making it a 3m apex for 6m marquees on a 2m leg), it’s been found to be the best angle for helping the wind to roll over the roof of the marquee. By way of example here’s a photograph of the 2012 Showmans Show (2013 not available as yet). 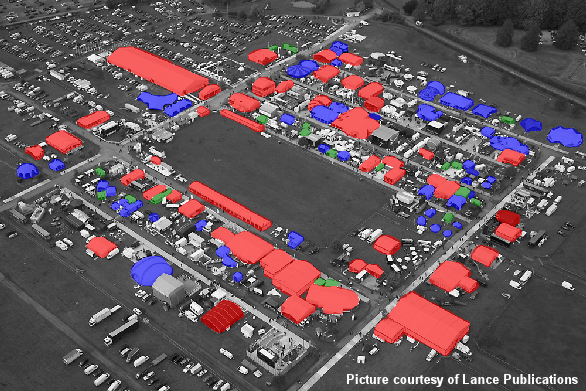 The marquees highlighted in red use a 20 degree pitched roof, the ones highlighted in blue don’t use a pitched roof (they are curved or peaked) and the ones highlighted green are marquees that we can’t recognise as 20 degree pitch roofs or not. Note that 20 degree pitch roofs are by far the most popular and the marquees that may use other angled roofs are the smaller ones – In 3m and 4m widths the overall roof areas are smaller where you can use a higher apex/steeper roof with fewer problems. When buying a larger marquee look for those that feature a 20 degree roof pitch, on a 6m wide marquee on 2m legs that means a 3m high apex. They may cost a little more to manufacture but it is worth it. There’s a reason it is the industry standard. The above was written by Colin King, former principal lecturer in Engineering. Translated in to ‘normal’ English by Spencer!